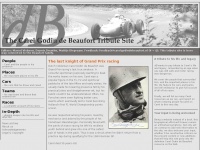 This website pays tribute to one of the most colourful and exuberant Grand Prix drivers the world has ever seen: Dutch nobleman Carel Godin de Beaufort. The web server with the IP-address 195.8.208.48 used by Carelgodindebeaufort.nl is run by Duocast B.V. and is located in Netherlands. This web server runs 9 other websites, their language is mostly english. A Microsoft-IIS server hosts the websites of Carelgodindebeaufort.nl. XHTML 1.0 Transitional is used as markup language on the webpages. Indexing the data of the website and following hyperlinks on it is explicitly allowed by robot information.